Guess what? Mactan just keeps getting better with more resort choices! 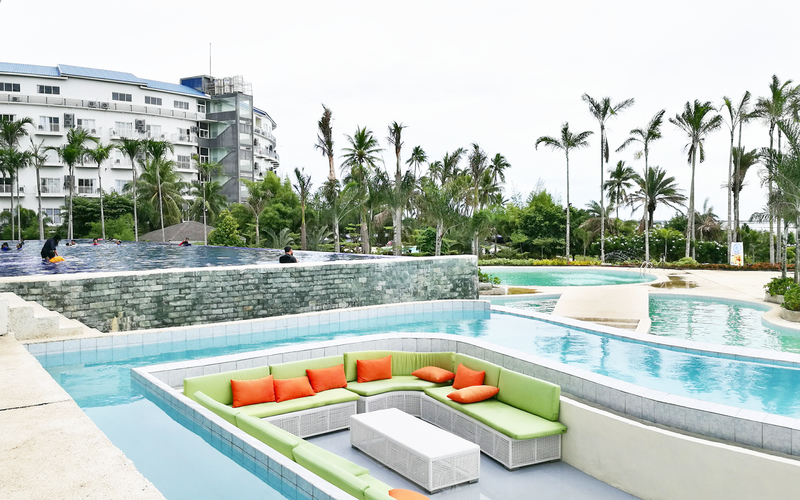 If you don't know it yet, I'm actually the kind of person who loves going on staycations and Solea Mactan Cebu Resort - the newest resort in town - I suggest, should definitely be on your top list. And boy, they got me with their colorful sofas inside the pool! When I saw photos of Solea Mactan Cebu Resort, I immediately researched about it and added it on the top of my list. When the opportunity came, I grabbed it and took with me my boys, Zayn and Sheen. Anyway, upon entering the resort, you will witness a magnificent view as you can see in the photo above and the tropical setting of the resort which was absolutely perfect. Solea Mactan Cebu Resort, I must say, has one of the most beautiful lobbies I have ever seen. I love everything from the color choices, interior design, concept, and the furniture. When we arrived at the front desk, Sheen and Zayn went on a nearby table and sat while I talked with their staff and paid. Their front staff were very nice and friendly and that's one more thing that I loved about the resort. Anyway if you're curious, you can check their day trip rates at the end of this post. Not a lot of resorts have infinity pools and Solea definitely did a good job with it. Their olympic-sized infinity pool offered us a beautiful view of the resort's entirety. The only downside was that the pool is not safe for kids because the tiles are very slippery. So to my fellow parents out there, if you're planning to go to Solea Mactan Cebu Resort, make sure you watch your kids when in the pool to avoid accidents. As I have mentioned earlier, this is what truly caught my attention! I saw photos on social media and I really wanted to see it firsthand. It was honestly my first time to see this kind of concept so kudos to Solea! The green and orange colors helped do the trick as well! No wonder it looks amazing in photos. This is totally chilling in the pool taken to the next level. I also loved that their kid's pool are really wide considering that during peak season, lots of kids will surely be crowding in it. However, their pool's quite tricky too. The area where the mushroom shower is located is the kid-friendly area as the water is below knee high. A few steps away, you can feel the pebbled floor which is an indicator that the water is deeper on the other side. The water is 4-feet deep only but of course, it's not kid-friendly for children like Zayn. And just like the infinity pool, their tiles are very slippery too. I wish they can do something about it. At around 12NN, Sheen and I decided to finally eat lunch to fill our starving tummies. When we went to Earth Restaurant, the staff outside told us that we are not allowed to go inside wet, and since Zayn was the only one who didn't change, we chose to dine outside instead. Thankfully, they have dining tables and chairs outside which was actually better for me since I love dining al fresco. Chafing dishes and other food display trays at the buffet spread are not refilled in a timely manner. It's quite disappointing opening the chafing dish only to see that there's nothing left inside. There was only one chef at their pasta and sushi station and it was difficult for the chef to accommodate multiple customers who requested a few pieces of sushi and have their choice of pasta cooked. Their buffet lunch does not include free drinks which is very disappointing too. And since we did not want additional charges, we opted for their service water instead. This is the resort's man-made lagoon with sea water, of course. While Zayn and I were going around, we saw people kayaking in the lagoon. I'm not sure what other water activities you can avail, but I think this is a nice feature of Solea Mactan Cebu Resort. It's evident that we, Filipinos, love to make the most out of every penny we spent, so here I am telling you that spending a day at Solea Mactan Cebu Resort is definitely worth it! And despite the not-so unfortunate experiences and the quite remote location, I want to go back there and stay overnight (hopefully when I can already afford. LOL). Been seeing this on Instagram! Have to visit when I go home to Cebu! Pila ang entrance na krn gwapa? They don't really have a "beach" since Cordova is not really blessed with nice beaches. They have a man-made lagoon for kayaking but I don't recommend it for swimming.